By this time of the year, you are probably sick of seeing plaid everywhere you look. You might even have a "plaid hangover", so to speak! But maybe not. There is definitely something that is very enticing about plaid; to me, its appeal honestly lasts throughout the year and not just for a couple months. Last week I shared my musings on how some plaid is only appropriate for the holidays, but I've realized that you can never have enough plaid in your closet. Case in point: I bought this plaid shirt a few days before Christmas, after I already had more than my fill of plaid, and although I already own quite a few plaid shirts, some even with a similar color scheme, I really liked the ruffle details on this shirt. 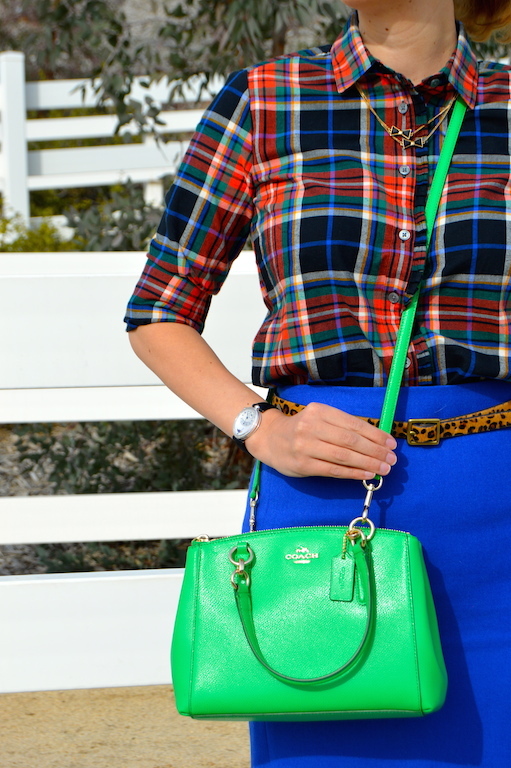 I tried to do something a little bit different with this traditional plaid print by playing up the bright colors in the plaid through a cobalt blue skirt and my new neon green bag. Picking out colors other than red and green that can be found in the plaid print is a good way to make an article of plaid clothing that seems very holiday specific last throughout the winter. Even though I am sharing my thoughts on how to wear this plaid shirt after Christmas, I actually wore this outfit on Christmas Eve. My husband and I have a tradition where we eat Christmas Eve lunch at one of our favorite restaurants. As my husband pointed out, it's not really a tradition because we only started it last year, but I am convinced that if we do it again next year it can officially be considered a tradition, as three times should most definitely qualify something as a tradition. Perhaps I will wear this shirt again next year too and make that a tradition as well. So pretty! Love the look and green purse! Thank you! The green purse is new and I think will soon become a favorite! Thanks! I am glad you agree that one can never have too much plaid! I hope you're having a great start to your week Kim! Thank you Sandee! I'd love to see the way you style your plaid for the non-holiday season! I think this outfit should definitely become your Christmas Eve tradition outfit. Love the idea of taking a less accented colour in the shirt like the cobalt blue and pairing it with the skirt. Navy or red would've been too obvious - still stylish but yes, too seasonal. And this outfit shows how you can take a item/pattern that is usually associated with more casual wear and dress it up. Personally, I love plaid all year round - plaid is for life, not just for Christmas! I'm glad to see I've found another supporter of all year round plaid! And yes, this outfit might just become a tradition, but I'll probably find a way to style it just a little differently.